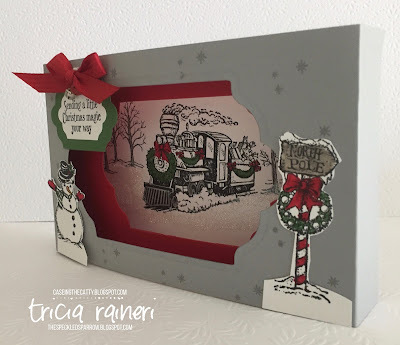 Welcome to the CASE-ing the Catty Sunday Blog Hop. It's an extra special hop today its our 100th! Today we are being inspired by the Presents & Pinecones section of the Holiday Catty pages 18-31. There were so many options to choose from in this section! 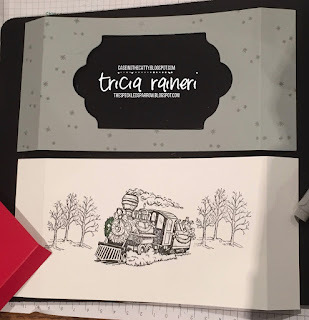 I have had an idea in my head since I saw the Christmas Magic stamp set, but until now I haven't had the chance to try it. Here is the image from the catty of this set. While this is certainly a lovely card, I couldn't figure out why the design team didn't use the gorgeous train stamp, that is a central part of this set on any cards in this catalogue. My son, had a slight addiction to Polar Express when he was younger & made me sit through hundreds of hours watching it. Once I saw this stamp set I just knew I had to get it. I brought back so many memories of us watching the movie & the lovely feel of it. How could I not use that train in my card today?! 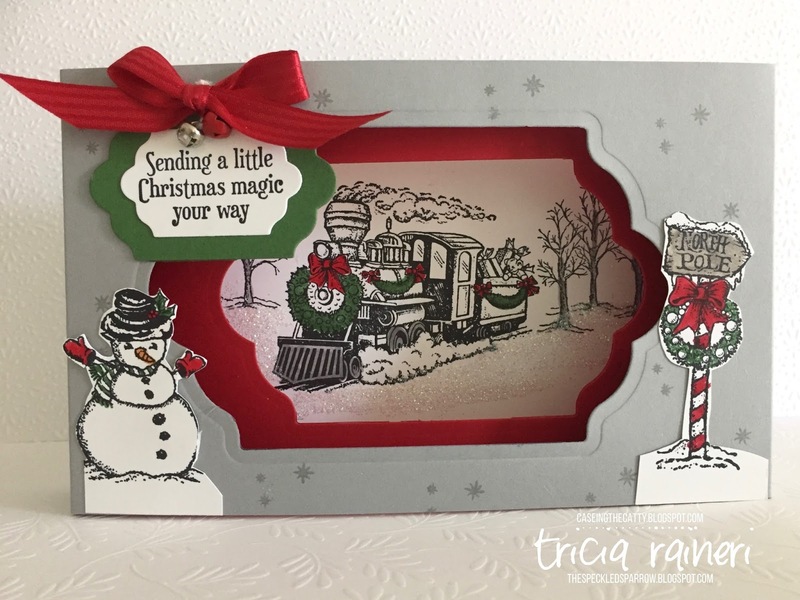 So, my card today is dedicated to him & his Polar Express addiction. I wanted to make this a special card. One that he can keep on his special shelf (where he keeps all things special to him) & a diorama card was my choice. I based my diorama card on one I found on youtube by Linda Dalke. As you can see the depth of my card is a lot skinnier than hers. I wanted to use this as a project for my stamp club ladies as well so they needed to be able to mail it if they created it. The great thing is this card folds flat so can be mailed. I also wanted to be able to get one card out of one sheet of card stock. If you use the same colour front & back you will only need the one sheet of A4 cardstock. For my project, however, I chose to use 2 different colours for the outside, Whisper White & Smokey Slate. I used Real Red as the inside layer. This colour scheme is actually pulled from the card featured in the catalogue as seen above. So, it really did inspire me. 1 piece of cardstock measuring 19cm x 10.3cm ( I used Real Red) scored at 1.5cm or around 1/2"
Extra cardstock for stamping & colouring the embellishments to the front. 2 x Jingle bells & some Dazzling Diamonds Glitter . Start by cutting out the windows. I start with the front piece, using the biggest framelit. I have used the Lots of Label Framelits, but you can use any shape as long as they're layering framelits & fit the card front. Lay this over the red piece to gauge where you want the smaller framelit to go & mark it with a pencil. I chose the next size down to cut this red window. Once these are lined up & cut, lay the red piece over the back piece (white) & use a pencil to mark my area that is visible. 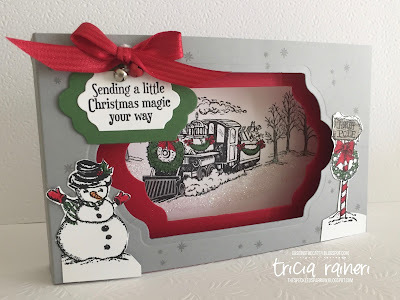 Then do my stamping on the white piece making sure the main item is visible in the window area. 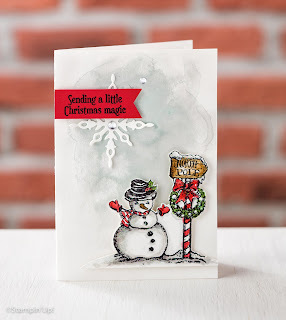 Once it is all decorated & glitter is applied, attach the red piece to the white piece, using tear tape. Decorate the front piece (Smokey Slate) with stamping & images & then attach to the back section with tear tape. The best way to understand the making of these cards is to watch Linda's video, it explains it all really well. Click on her name above to go to her video. 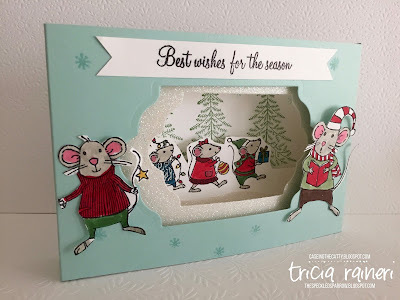 I made another diorama card while I was perfecting the technique, using the cute Merry Mice set. It really is a versatile layout. This time, I popped up the little mice on the base layer giving the impression of a third layer. Well, that's it from me today. Thanks so much for hopping along with us. 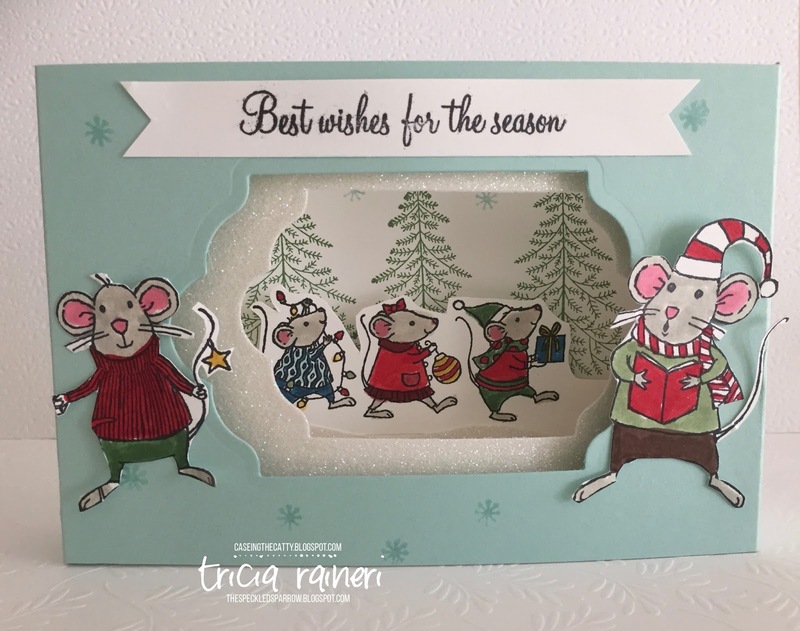 I hope you are inspired to give a diorama card a go yourself or maybe even create something inspired by our awesome catalogues. 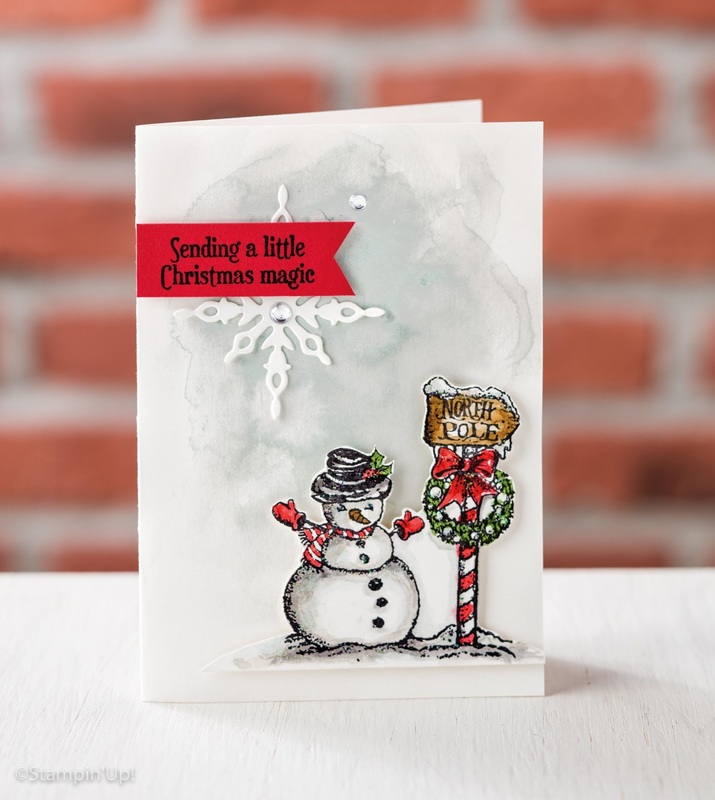 Next on the hop is Bronwyn from Addinktive Designs where I am sure you are going to be totally inspired, I just love her 3d items! As always, don't forget you can join in the fun & share something you've made inspired by this section too. Just click through to the link below to add your creation.